The liquid packaging carton market accounted for revenue of $14,310 million in 2017, and is anticipated to reach $20,747 million by 2025, registering a CAGR of 4.7% from 2018 to 2025. Food or beverage packaging is a technique used for packaging of edible products to ensure preservation, containment, marketing & information, traceability, convenience, and other functions. Liquid packaging cartons are containers, which enable safe transportation and storage of liquid products, and provide customized packaging based on the marketing requirements of manufacturers. These cartons are preferred by manufacturers due to their benefits such as convenience, maneuverability, recyclability, and eco-friendly attribute. They are specially designed for carrying liquids such as milk & dairy products, packaged water, liquid food products, soft drinks, and juices. The global liquid packaging carton market is segmented based on type, shelf life, end use, and region. Based on type, the market is categorized into brick liquid cartons, gable top cartons, and shaped liquid cartons. Based on shelf life, it is bifurcated into long shelf life cartons and short shelf life cartons. By end use, it is classified into liquid dairy products, non-carbonated soft drinks, liquid foods, alcoholic drinks, and others. Based on region, the liquid packaging carton market is analyzed across North America, Europe, Asia-Pacific, and LAMEA. Some of the major players analyzed in this report are Greatview Aseptic Packaging Co., Ltd., BillerudKorsnäs AB, Tetra Laval International S.A., Nippon Paper Industries Co., Ltd., Smurfit Kappa, Reynolds Group Holdings Limited., Liqui-Box, ONEX Corporation, Ferd, and Adam Pack SA. These market players are competing against each other through innovation and development. In an instance, Greatview Aseptic Packaging Company Limited has acquired Qingdao Likang Food Packaging Technology Company Limited (“Likang”) at a cash consideration of USD 15.5 million. Likang is based in the Shangdong Province of China, and its business is the production of aseptic packaging cartons for its customers in China. This acquisition has reinforced company presence in China. Furthermore, Tetra Pak subsidiary of Tetra Laval International S.A. has launched a suite of new packaging material effects, known as Tetra Pak Artistry, to help food and beverage producers revitalize the look and feel of their products. This product launch has strengthened company's portfolio. Asia-Pacific is one of the fastest growing regions in the global liquid packaging carton market size. 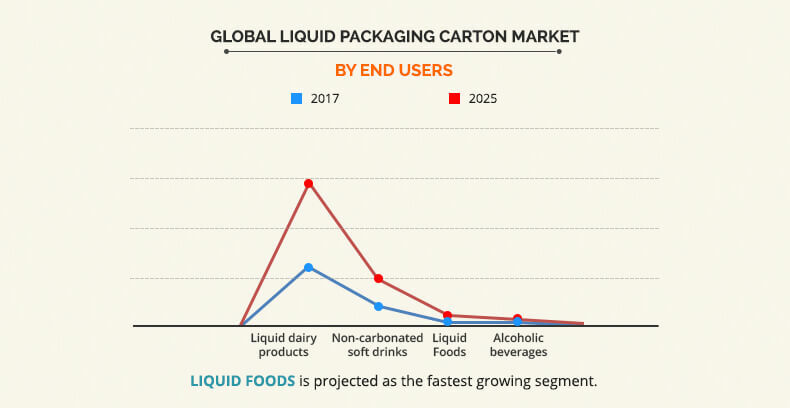 Growth in population in Asia-Pacific, increase in disposable income, and stable economic growth fuel the growth of the liquid packaging carton market. Emerging markets such as China and India are expected to show the highest increase in demand for environmental liquid packaging carton. Rise in liquid packaging carton demand from Australia is projected to be more reserved, owing to the sustained shift of the manufacturing base to other countries, and decrease in exports resulting from capacity increase in other Asian countries. Based on carton type, the brick liquid carton segment garnered the largest share in 2017. This is attributed to the fact that manufacturers opt for low-cost brick carton packaging materials, due to their cost-effectiveness to reduce overall cost of production. This allows manufacturers to produce brick liquid carton at relatively low cost, which majorly drives its adoption. 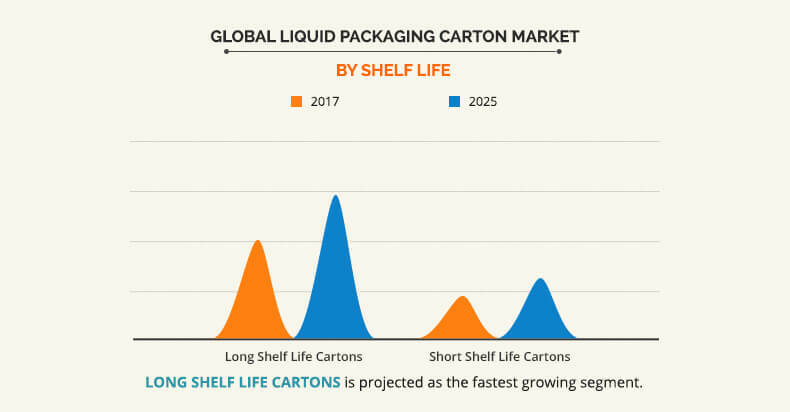 Based on shelf life, the long shelf life carton segment is expected to be the fastest growing segment owing to its increased used in dairy and liquid food products that are perishable in absence of controlled storage conditions. These cartons are made of paperboard, polyethylene, and aluminum. The shelf life ranges from 3 months to 1 year, before opening. Based on end user, liquid food is projected to be the fastest growing segment owing to increase in the production of green packaging systems to reduce the negative impact on the environment. This trend is expected to drive the demand for liquid packaging carton. Porter’s five forces analysis helps analyze the potential of buyers and suppliers and the competitive scenario of the liquid packaging carton industry for strategy building. It outlines the current trends and future scenario of the Liquid Packaging Carton market trends from 2017 to 2025 to understand the prevailing opportunities and potential investment pockets. 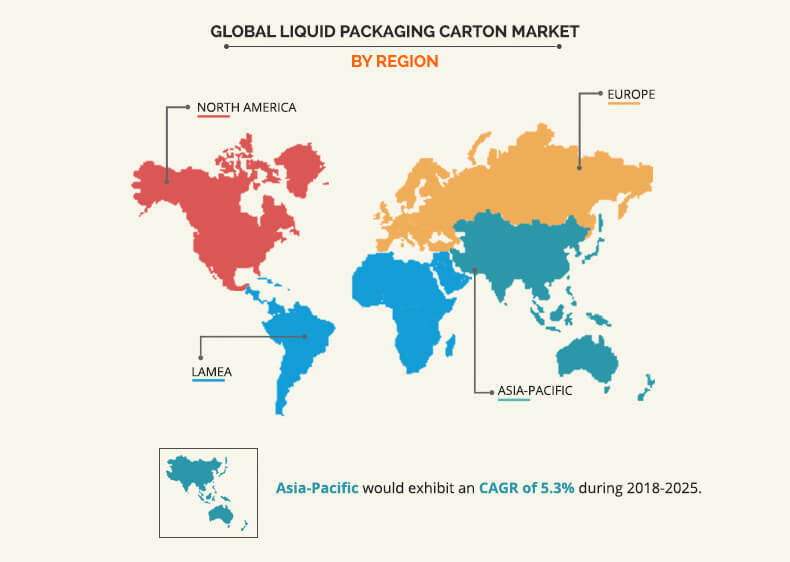 Major countries in each region have been mapped according to their individual revenue contribution in the global liquid packaging carton market analysis. The key drivers, restrains, and opportunities and their detailed impact analyses are elucidated in the report. 8.4. GREATVIEW ASEPTIC PACKAGING CO., LTD. The liquid packaging carton market witnessed significant growth in the recent years. Packaging plays a crucial role in improving the aesthetic value of a product and draws attention of consumers. Retailers and wholesalers have stressed on the need for variations in packaging size as well as functionality to cater to diversified needs and trends of various segments. The adoption of eco-friendly designs and other advanced packaging strategies for paper-based and other forest-based products is expected to revolutionize the global liquid packaging carton market. These strategies not only focus on the renewability aspect but also emphasize on providing differentiated offerings to satisfy the functional and sustainability needs of varied market segments. 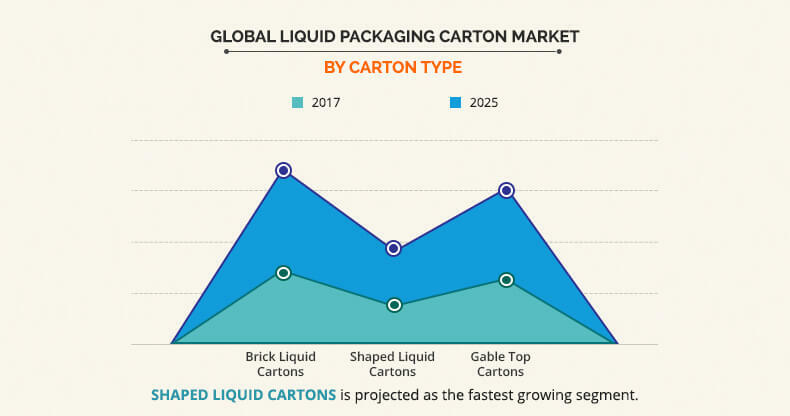 The Asia-Pacific liquid packaging carton market offers promising opportunities for packaging and paperboard manufacturers, due to widespread consumption of packaged food & commodities and rise in disposable income. 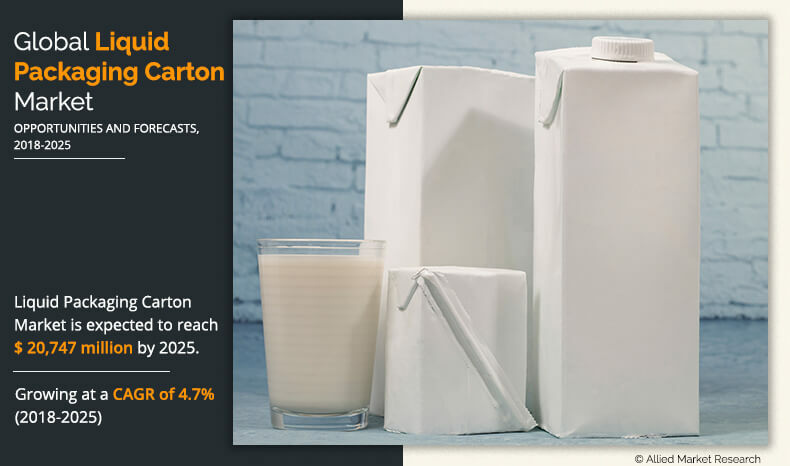 Surge in demand for cartons with prolonged shelf life is expected to increase in North America, owing to increase in demand for liquid packaged products.